Our tradition of integrating multiple aspects of manuscript studies, embracing the material, textual, historical, cultural, and wider contexts, along with our steady collaboration with other organizations at the Congress, led to the requests for all these sessions. Our dedication to promoting the research work and organizational skills of expert younger and also Independent scholars and teachers gathered wider participation and collaboration. These modes of joining forces across different fields of study, levels of experience, and areas of expertise allowed us not only to marshal our collective abilities, but also to foster rapid contacts between different fields, which might normally take decades. We worked to continue this positive, shared tradition. 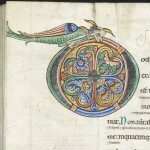 The post by Sarah J. Biggs (30 July 2012) to the British Library blog on Medieval and Earlier Manuscripts provides an illustrated announcement for all our sessions: Once More Beneath the Surface. 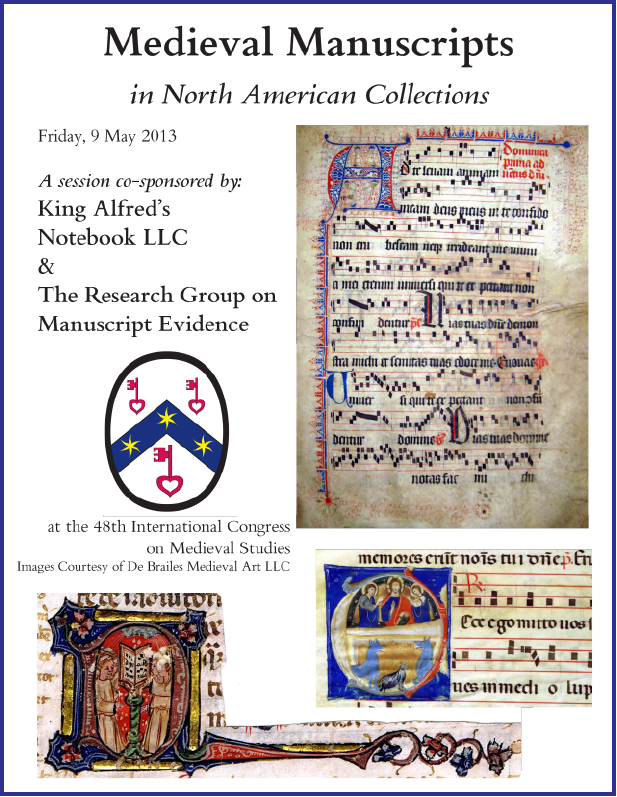 Call for Papers for Kalamazoo 2013. With permission, we reproduce one of Sarah’s selected images for her blogpost. 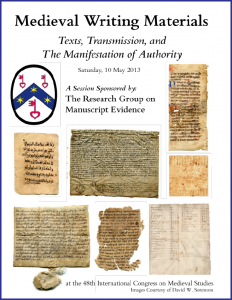 Information about the manuscript containing that image appears online. 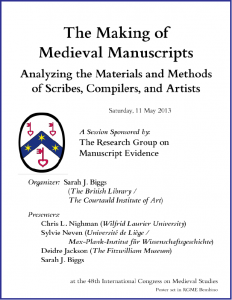 Our session addressed the complex interface between the study of medieval manuscripts and the transmission of knowledge for, and the application in practice of, medieval techniques for preparing their materials, texts, compilations, and illuminations. The papers reported advances in art-historical, textual, philological, and historical analysis of a variety of texts and images, including production techniques, compilation practices, and their transmission across time and place. The study of writing materials is of value not only as a subject in its own right, but also as a source of information regarding the texts and images associated with them, the methods of their production, and the authority of their testimony as records of whatever sort. Continuing our series of sessions on this theme, from year to year [2011–2014 etc], this session sought to explore, develop, and advance these interlinked subjects, and to disseminate the results among many relevant (but seemingly unrelated) areas of study. 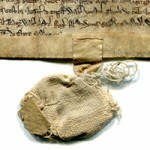 The contributions examined materials used for preparing written texts and forms of evidence for authenticating them. Italian mercantile archival resources preserved in Prato demonstrate extensive trade in writing materials. Unexpectedly useful methods for establishing the “authority” of “marginalized” – that is, isolated and often disregarded – texts and fragments as sources could emerge through careful study of the dating criteria of the Islamic paper itself on which many are written, in different languages and regions. Other reports presented case-studies of Silesian ducal charters and of the complex context for the transmission of Rhygyfarch’s ‘Lament’ of 1094 on an intrusive leaf in a twelfth-century Welsh manuscript of Cicero’s Somnium Scipionis. Our explorations across a wide range of texts, periods, and lands offered scope for interdisciplinary discourse and feedback for the development, refinement, and exchange of significant methodologies in manuscript, documentary, and related studies. 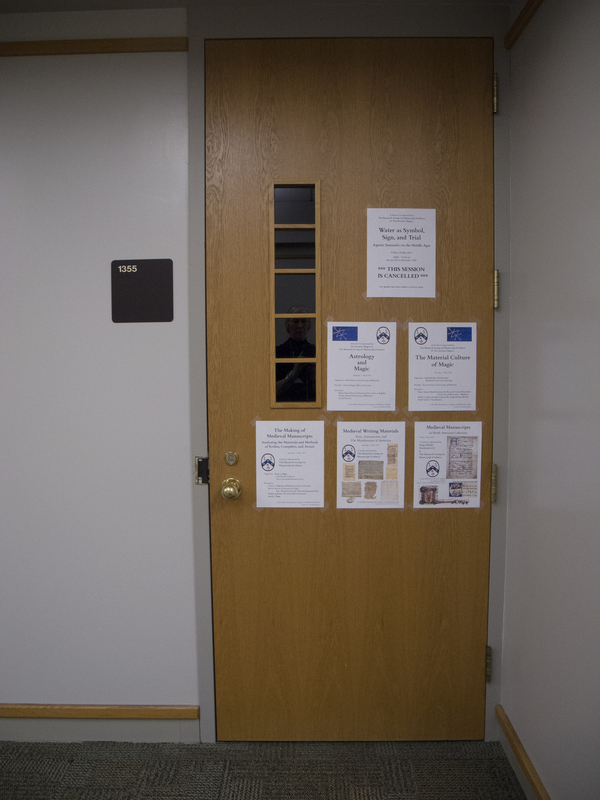 As before, Dr. Sorenson generously contributed the images for the posters and provided a display of original manuscript materials (on paper and vellum in various languages) for examination and discussion at the session. Recently the many different insights that palaeography may offer to the study of Middle English poetry and prose have taken on new clarity. Amongst many others, these include the circulation of Wycliffite literature (for example, were there such things as Lollard scribes, and what did they produce? ), the role of, and audience for, Carthusian scribes (how extensively, if at all, did Carthusians disseminate literature to lay readers? ), and the identity of Adam Pinkhurst (was he Chaucer’s “owen scryveyne”?). The field has benefited from the appearance, in the last few years, of various new tools for research, including Jane Roberts’ Guide to Scripts Used in English Writings (London, 2005), and the Late Medieval English Scribes project (www.medievalscribes.com), developed by Linne Mooney, Simon Horobin, and Estelle Stubbs. 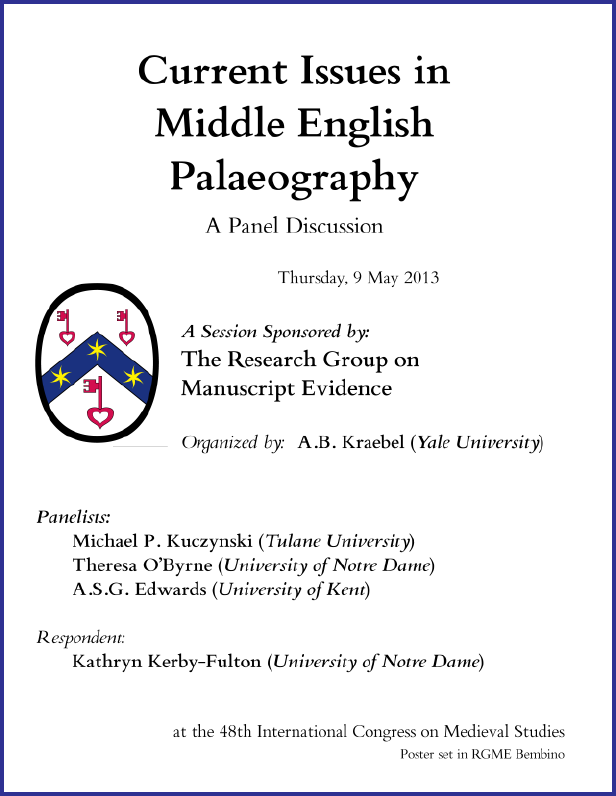 For this panel, contributions addressed questions of Middle English palaeography and literature, along with these and other new palaeographical tools. Our panel aimed to encourage new work in this developing and exciting field. 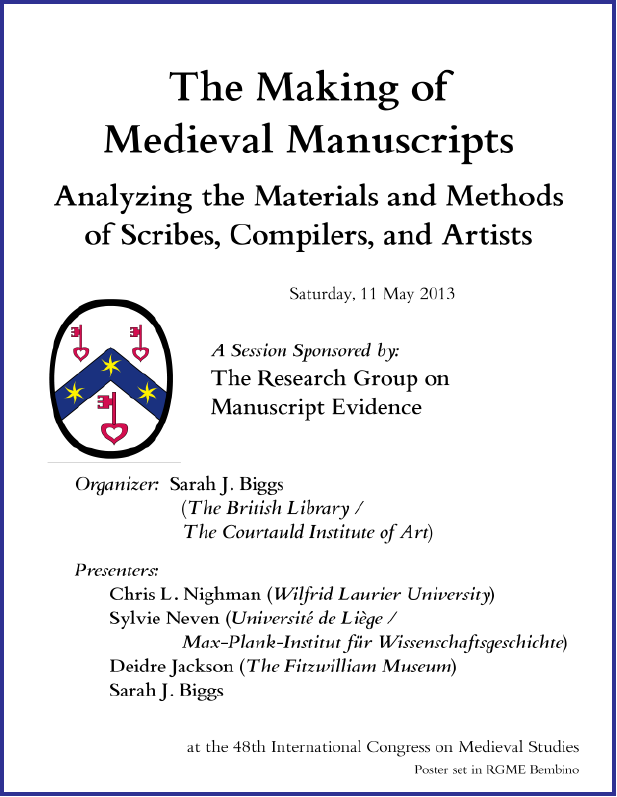 This co-sponsored session both built upon and extended our 2012 session on medieval manuscripts in the New World. 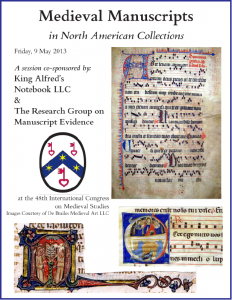 Approximately 30,000 medieval and Renaissance manuscripts can be found in North American collections. Some 20,000 of these are fragmentary: single leaves, disbound bifolia and quires, or cuttings large and small. 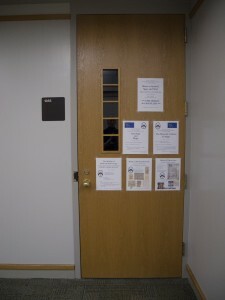 Relatively few of these sources have been examined carefully, especially at smaller college and university libraries.Moreover, American libraries have been rapidly acquiring manuscripts over the past few decades. Ohio State University has added a dozen codices and scores of leaves, the University of Pennsylvania (through the Schoenberg gift) has increased its holdings by more than one hundred codices, and the University of South Carolina has acquired five codices and sixty leaves. Even the smallest collections have undiscovered treasures, as shown by recent publications on neglected and newly recognized manuscripts, including a fragment of Ars Nova polyphony at Columbia College, South Carolina, and a Book of Hours at the Redwood Athenaeum in Newport, Rhode Island. 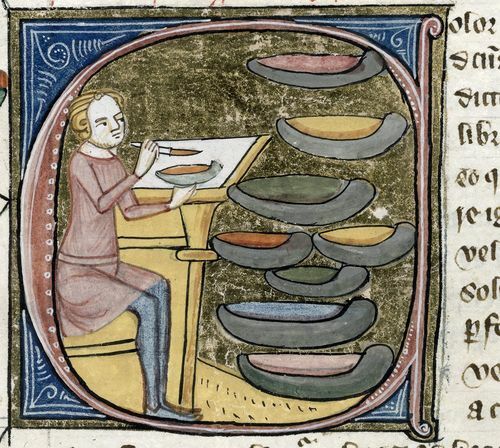 Many manuscripts in institutional and other libraries are being digitized in order to reach a larger audience of students and scholars. This session aimed to galvanize, present, and foster investigation into North American manuscript collections by introducing seemingly invisible archives with sources ideal for study in print or digital form. 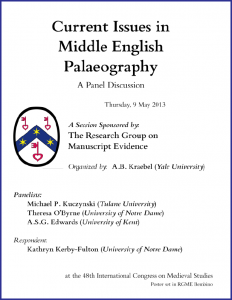 The papers addressed a variety of genres, materials, challenges, and potential for teaching and scholarship on medieval manuscripts or collections, as well as the history of collecting medieval manuscripts and fragments. Astrology was employed in the elaboration and timing of magical ceremonies, and served as their broader cosmological backdrop. Likewise, magical and astrological treatises often traveled together in manuscript. This session was designed to open up a codicological perspective on the intersection between astrology and magic. The papers explored the links between the theoretical justifications for the functioning of magic via celestial influences — or “rays” — and the links between the material components of spells and astrological signs, lunar mansions, and/or planets. The description and conceptual visualisation of magical artefacts is well-known from medieval written sources, which sometimes dwell on procedures to make and use magical objects at length. Depending on their nature, magical artefacts themselves survive in varying numbers. 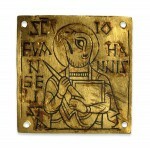 Protective amulets and verbal charms made, for instance, from parchment, wax, or lead, survive in conspicuously larger numbers than objects of theurgic magic, such as the Sigillum Dei, even though the production of both groups of objects is described in detail in medieval manuals of magic. This session focused on the information which magical artefacts provide about magical practices, in addition to what the written sources tell about the construction and use of these artefacts. 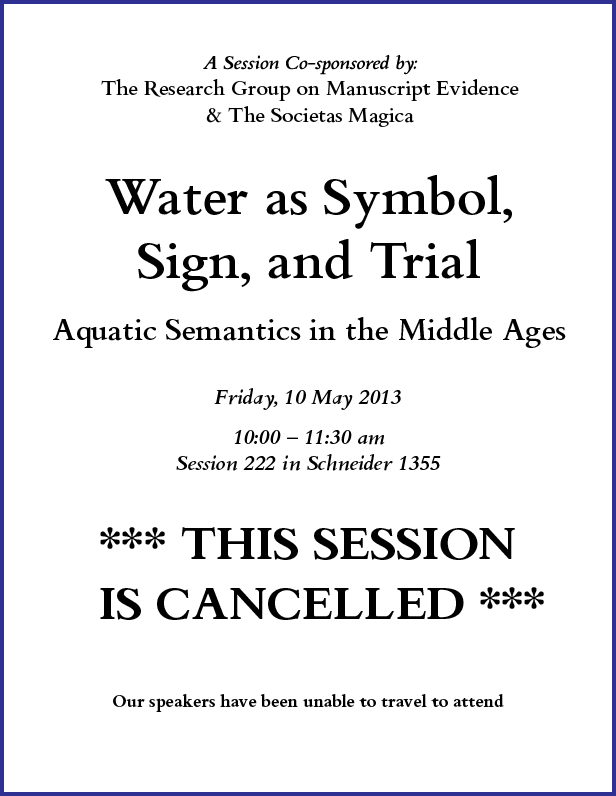 Note: This session had to be cancelled shortly before the Congress. From its very beginnings, mankind has recognized in water an element of immense complexity and fundamental importance for life and death, for redemption or doom. Whether traditional or modern, archaic or contemporaneous, religious or secularized, many cultures over time have integrated water within their narratives, as the one of the most powerful symbolic complexes, by using it as sign of tacit or explicit desires, hopes, anxiety, and faith. The close interface with human existence and destiny directed humans to see in water, or in aquatic powers, a magical ally in their attempts to influence Fortuna. 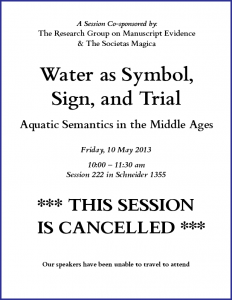 This session was designed to consider ways in which medieval cultures across Europe conceived of water in religious, juridical, and magical valences, as manifested in attitudes and in everyday life, as well as in exceptional or emergency situations. From birth to burial, from the afterlife to the End Times, water has ever accompanied and even impacted human life not only in its physiological-material, but also in its symbolic-magical, forms. Though omnipresent, water in its semiotic ramifications within medieval cultures has not been studied adequately. Our session sought to draw attention to one of the most important and under-researched topics in the cultural history of the Middle Ages. 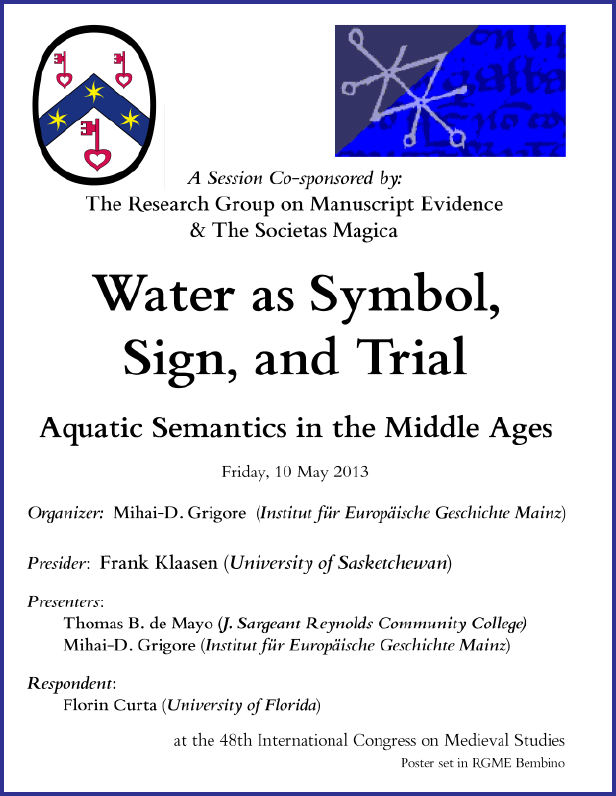 Themes to explore included not only aquatic initiations and ordeals, visualizations of Heaven and Hell, and the symbolic topography of water and waters within the medieval imagination, but also the presence of themes, motifs, rituals, and spells involving aquatic symbolism and crafts in medieval manuscripts, inscriptions, and images. The Societas Magica also sponsored a session on “Magical Practices in Pre-Modern China” organized by Dimitri Drettas (Centre de Recherche sur les Civilisations de l’Asie Orientale, Paris). This session emerged from the response to Dimitri’s contribution to our co-sponsored session on “Dream Books” at the 2012 Congress. 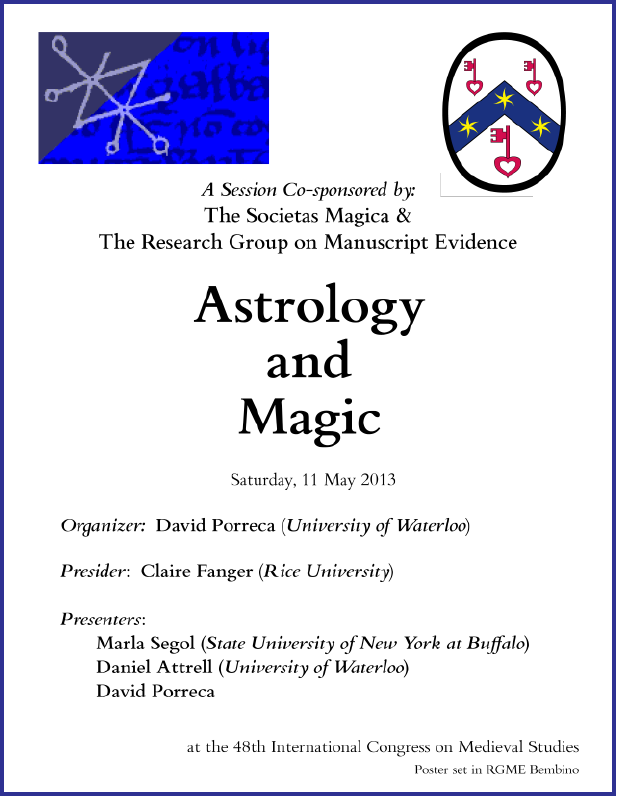 The full Congress program is archived as The printed program of the 48th International Congress on Medieval Studies (May 9-12, 2013), including the Corrigenda, which correct the Program attribution for the sponsorship of “Astrology and Magic” (Session 441). The list of Societas Magica sessions is archived as Sessions and Meetings sponsored by the Societas Magica.